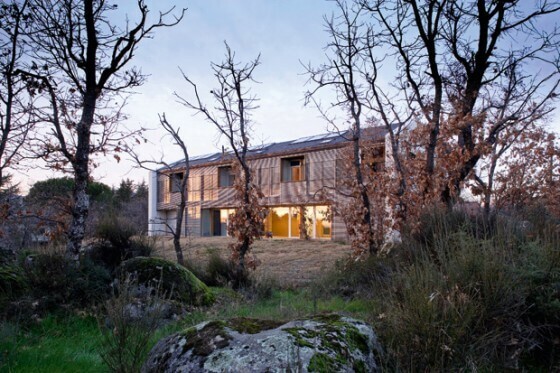 Pilot project built by the company Fujy Arquitectura por naturaleza and designed by Luca Lancini, Fuji House is a detached house in a village about 40 km from Madrid, near El Escorial. The construction was made according to the criteria of bio climatic architecture using the latest advanced technologies that allow high energy performance. The aim was to have a minimum environmental impact and maximum reproducibility of the structure, so there were taken into account several aspects like the environment, the type of the materials used, volumetric spatial configuration and its layout, the type of heating system that allow for very low consumption. The house has a contemporary design, it’s volumetric composition being simple. So the plan of the building is structured on two levels, a rectangular shape and compact, and its major axis is oriented in the direction east-west sun exposure to get maximum benefit. It was built of brick thermo-acoustic and multi-certified wood structure. For the construction cranes were used gas-powered and has introduced new insulation and low environmental impact. In terms of a bio-climatic approach, the function of living requires a correct spatial arrangement of the functions in relation to the type of activities in different times of day or year. This type of functional distribution plans to make the most of thermal and lighting qualities of solar radiation. By bio-climatic principles and strategies used, Fuji House is a body that works synergistic-ally with the environment, helping to integrate a holistic concept that refers to all life stages of building components.